Today, I received a gift in the mail from my dear sister Alice in Canada. It is a beautiful gift with the image of Gustav Klimt‘s The Kiss. She noticed from one of my posts on another blog that the most stunning painting I saw is The Kiss by Klimt at the the Belvedere Palace and Museum. I can’t thank her enough, and so I think it may be good to post this beautiful painting in order to say “Thank You” to my sister. Some years ago, during a trip to Vienna, my friend and I had a wonderful time at the Belvedere Palace and Museum One of the most unforgetable memories is seeing this beautiful painting. Here’s the image from the Belevedere’s website. The Belvedere Palace and Museum is now celebrating 150 years Gustav Klimt with a Jubilee Exhibition from July 13, 2012 to January 6, 2013. If you have not been there, go now and see this painting yourself. The Belvedere has the largest collection of Klimt’s paintings worldwide. If you happen to be in Vienna or nearby, don’t lose this opportunity. None of the images on paper or on-line, can be compared to the live painting. I still remember the feeling standing in front of this wonderful art piece, only a feet or two away. Unlike Mona Lisa which is small and so sheltered from the public, “The Kiss” is close to you, as if you are part of the painting. 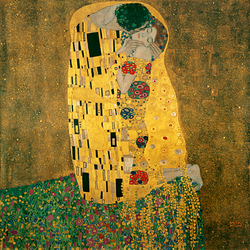 If you are interested to know more about this painting, here’s an excerpt from the Wikipedia – the Kiss (Klimt). Constantino said that the ornamental symbolism of the garments has led to the interpretation as a symbol of the union between the man and the woman. The man has an angular form, whereas the woman is soft. The woman’s head is at an extreme angle, giving the impression that she is passive, and the man dominates and initiates the action of the kiss. The interpretation of this painting has never stopped, and the world is still talking about this. Is this representing a union of the two sexes, or a depiction of tension between them? Whatever the interpretation is, The Kiss remains the most popular painting of Klimt. No doubt Klimt has created a masterpiece combining the aesthetics of Vienna Secession and Symbolism, and demonstrated his contribution to the development of Art Nouveau, The fascination for The Kiss is comparable to that which surrounds the Mona Lisa. I am interested to know, what is your interpretation? Before you start making your conclusion, I would like to share with you this video which I just found. I think it is very helpful for me to understand more about the background of this painting. Its reference to the Hagia Sophia‘s gold leaf mosaic paintings, is particularly interesting to me since I visited Hagia Sophia just a year ago. I did post pictures of the Hagia Sophia in my other blog: Exploring Turkey and Greece. Please see this video, and let me know your interpretation of The Kiss. Lovely post, tempting : I should think of revisiting Vienna … I think “it’s a union of two sexes” rather than tension between the two (my opinion). Thanks for your comment. I tend to agree with this interpretation. But I also think that it does have additional meaning. I hope to hear from others and start a discussion thread. no problem, thank you for liking some of my posts!